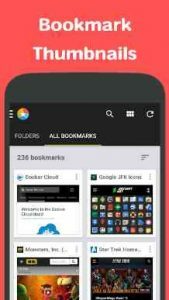 Bookmark Thumbnails and Folders app is a simple bookmark manager to store and organize your favorite webpages. You can view your bookmarks as thumbnails instead of a list. You can use bookmark folders to organize your bookmarks. Just downloaded.. impressive app.. but need sync option with firefox & chrome.. I like that the app gives a screen shot of the page you’re saving. I just wish there was a way to import the bookmarks from chrome on android. It told me that function was not available. So I am having to put in each one, one at a time. I would also adding a select function. So you can move or delete several things at once. Decent app. Would like some colour themes, pitch black for amoled users for example. The design is a bit dated, but overall i quite like the functionality.